The birth of this model from the house of Audi is result of several other successful stories company created in recent past. It started with released and grand success of A7 followed by more powerful S7. 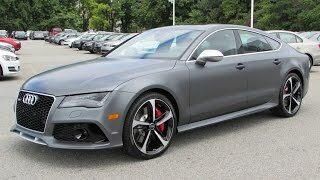 Upon getting appreciations all around company decided to bring the better and faster RS7 in 2014 and finally bringing the updated version for this year through the revised Audi RS7 Sportback 2015. 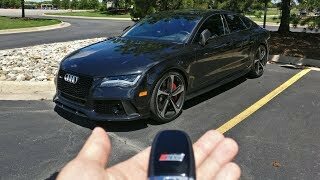 Let us have a look at the review of Audi RS7 Sportback 2015; the elegant beast (as mentioned by many) and get to know more about it. Interior of Audi RS7 Sportback 2015 carries the honeycomb pattern with the bright seats complimenting the dark cabin. The instrument cluster gets revision with air vent controls and shift paddles joining the same queue. Front of them stands a flat bottom steering wheel wrapped in black leather and mounted with various functions that make it look stunning and be useful in many ways at same time. Part of door-panels matches the color of seats while the rest is dipped in dark accent. Seats get honeycomb pattern designing while the Quattro emblem adores the glory of instrument panel. The multimedia infotainment screen comes as standard with the Audi RS7 Sportback 2015 and is very well mounted over the air vents in center. Exterior of Audi RS7 Sportback 2015 gets a lap ahead of in stunning looks presented by its predecessors. The trapezoidal grille gets the Audi emblem over it and sits as gorgeous as before amidst the single frame headlights with LED daytime running lights. Company also gives you an option to go for matrix LED technology that comes with darkened trims. Bumper too gets bit of revision and comes with sharper edges and angles housing fog lamps and sleek air vent to pass some fresh air to the engine. Moving towards the rear fascia of Audi RS7 Sportback you’ll notice the updated taillamps and being frank this is the only change that can be noticed at the back. 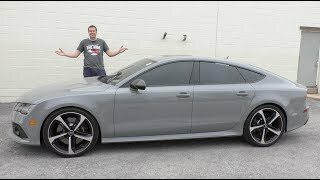 However rounding up the entire exterior of Audi RS7 Sportback 2015 that will be coming in four new colors, we would say it’s gorgeous than before. 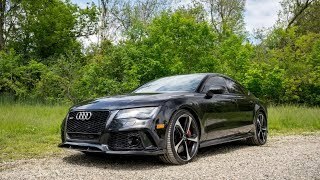 Beneath the hood of Audi RS7 Sportback 2015 sits a 4.0 Liter V8 engine generating total output of 560 hp and peak torque of 700 nm mated to eight-speed tiptronic automatic transmission. With these power figures, the Audi RS7 Sportback 2015 top speed touches the mark of 174 mph and 189 mph when blended with optional dynamic packages and can reach 62mph from standstill in 3.9 seconds only.